Hepatitis is an illness of the liver. It can have many causes. The alphabet soup of hepatitis can be confusing for parents. Hepatitis A, B, C, D, E and G are all different viruses. They differ in their symptoms and in the way they are spread. In the United States, hepatitis A is one of the most commonly occurring of the vaccine-preventable diseases. It is even more common in developing countries. Of all the viruses that can cause infectious hepatitis, hepatitis A is one of the most important. It is the most common and the easiest to catch. (Other viruses include adenoviruses, arboviruses, CMV, enteroviruses, Epstein-Barr virus, herpes simplex, HIV, parvovirus, rubella, varicella, and the hepatitis viruses themselves.) The hepatitis A virus is one of the enteroviruses (enterovirus 72). Anyone can get hepatitis A. In the United States it is most common in school-age children. Those that are most likely to get it are those who have close personal contact with someone with hepatitis A, those who swallow the virus in infected food or water, those who are part of an outbreak (such as in a day care center), or those who travel internationally. The classic symptoms are jaundice (yellow skin and eyes), fever, fatigue, nausea, and loss of appetite. It is important to note that most young children with hepatitis do not have jaundice. In fact, most have no symptoms at all – but they can still spread the disease. Also, hepatitis A can cause other symptoms, such as vomiting, diarrhea, constipation, or tummy aches. Yes. It is spread when the virus (usually in stool or on hands, food, or water contaminated by stool) gets in the mouth and is swallowed. People who are sick are most contagious for the weeks before they develop symptoms. By the time they have been jaundiced for about a week, they are usually no longer contagious. The length of illness can vary considerably, but typically lasts for several weeks. Hepatitis A should be suspected when there is jaundice in people who spend time with the child. In day care centers, for instance, it may not be until jaundice is noticed in an adult that the diagnosis is made in the children. If it is suspected based on the history and physical exam, the diagnosis can be confirmed with simple blood tests. 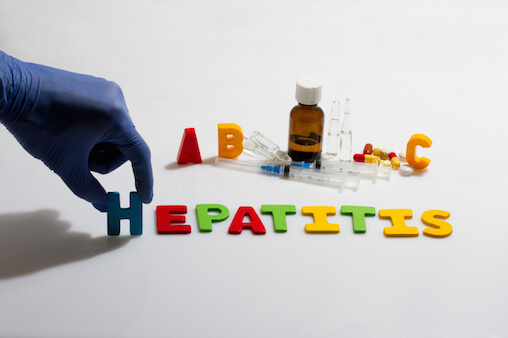 Currently the main treatment for hepatitis A is to manage the symptoms and to provide the necessary support. Antibiotics are not useful in treating it. Careful hand washing can reduce the spread, especially after toileting and before preparing, serving, or eating food. People with hepatitis A should stay home from work or school for the first week of symptoms to reduce exposing others to the virus. An effective vaccine is available. It is routinely recommended by the CDC for children at 1 year of age. Also, for close personal contacts of a person known to have hepatitis A, hepatitis vaccine or immunoglobulin may be appropriate prophylaxis. Exposed individuals should contact their physician in this situation.